The high court heard arguments in an appeal by the Republican-led state House of Delegates in defense of 11 state House districts that a lower court ruled last year violated the rights of black voters to equal protection under the law under the U.S. Constitution's 14th Amendment. In January, the court signaled that the Virginia Republican legislators face an uphill battle when it rejected their bid to block new electoral maps - ordered by the lower court to replace those being challenged in the racial gerrymandering case - from being drawn to use in the state's elections this November. One way the court could resolve the case is to say that the House of Delegates, which sought to appeal the ruling, did not have legal standing to do so. The state's Democratic attorney general, Mark Herring, has argued that the House cannot pursue the case independently and that only he could decide whether or not there would be an appeal. Some of the nine justices appeared sympathetic to Herring's argument, although it is unclear if there is a majority in favor of that outcome. Conservative Justice Samuel Alito suggested that the court could send the case to the Virginia Supreme Court to decide who can represent the state. "I would be very uncomfortable trying to decide whether, as a matter of Virginia law, anybody other than the attorney general can ever represent the Commonwealth," Alito said, referring to Virginia. Morgan Ratner, a lawyer for President Donald Trump's administration, argued that the House of Delegates does not have standing to appeal. But Ratner said that the House of Delegates is correct that the lower court used the wrong standard to assess the districts. Conservative Justice Brett Kavanaugh, appointed last year by the Republican president, expressed sympathy for the Republicans who drew the maps. If the legislators placed fewer black voters in each district, Kavanaugh said, "they would get hammered from the other side, saying you are discriminating against African American voters because you're not giving the voters a sufficient opportunity to elect the candidate of their choice." When the litigation first reached the high court, the justices in 2017 threw out an earlier lower court ruling that had found the 11 districts, as well as one other district, to be lawful. 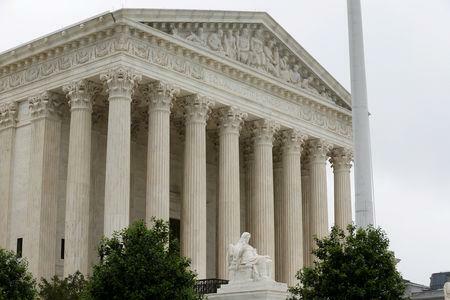 The justices said the lower court had not sufficiently analyzed the consideration of race by the Republican legislators in the process of drawing Virginia's electoral map.